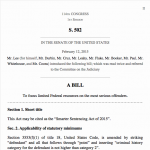 The Smarter Sentencing Act (S. 502/H.R. 920) is a bipartisan bill sponsored by Senators Richard Durbin (D-IL) and Mike Lee (R-UT) in the U.S. Senate and Representatives Raul Labrador (R-ID) and Bobby Scott (D-VA) in the U.S. House of Representatives. The bill does not repeal any federal mandatory minimum sentences, but instead reduces prison costs and populations by creating fairer, less costly minimum terms for nonviolent drug offenders. Save billions spent on incarcerating nonviolent drug offenders. The bill will not repeal mandatory minimum drug sentences, but reduce them. Save expensive prison beds for more dangerous offenders. 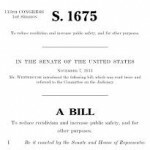 The bill will slightly expand the existing federal “safety valve,” 18 U.S.C. § 3553(f), for drug offenses. Remedy a long-standing racial injustice and strengthen black communities. The bill will permit 8,800 federal prisoners (87% of which are black) who are imprisoned for crack cocaine crimes to return to court to seek fairer punishments in line with the Fair Sentencing Act, a unanimously-passed measure that reduced the racially discriminatory disparity between crack and powder cocaine sentences in 2010. Address over-criminalization. The bill will require the Justice Department and other federal agencies to compile, and make publicly available on their websites, lists of all federal laws and regulations, their criminal penalties, and the intent (mens rea) required to violate the law.